Margarita is a 14-year-old, 9th grader at South Broward High School. She was born in Nicaragua, which is why her strong Spanish accent comes out every once in a while. 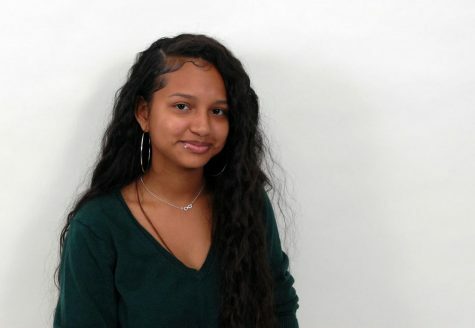 She signed up for Journalism because she wanted to try something new and because she didn’t really know what other class to choose this year. What interests her about Journalism is photography. Her greatest strength academically is science and her weakness is math. Her favorite kind of music is Reggaeton and Spanish Trap, well, actually any type of music in Spanish. She dislikes rap music because she thinks it’s “too much” and because she barely understands what the rappers are saying. She considers herself to be a cat, more independent because of the fact that she doesn’t like relying on anyone else but herself. If she could visit three places, anywhere in the world, she would visit Hawaii, China, and Brazil. If she could have any superpower, she would choose to fly because she can go to places quicker. Her favorite animal is a Parrot. Her favorite plant is a Mango Tree and favorite color is turquoise.